If you want a slightly longer party or can’t decide between slime making and hair raising, book our Chemical/Electrical Extravaganza! Having a themed party? Our Chemical/Electrical Extravaganza can be adapted to suit your theme at no extra cost. In the past we have run Harry Potter parties, Star Wars parties and Princess parties! In these cases, the activities remain the same but the language we use changes (e.g. 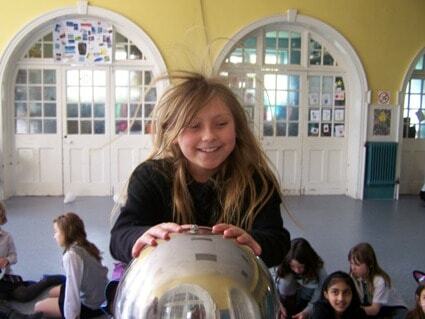 the Van de Graaff generator becomes a Wingardium Leviosa machine in a Harry Potter party or a force lightning creator in a Star Wars party!) and we change the colour options for slime making to fit in with the theme. If at all possible we will also try and source a character from your theme and make one of our explosions erupt from inside them but this is subject to availability. If you are thinking of having a themed party please do let us know and we will see what we can do.